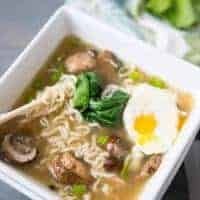 This Ramen Noodle Soup could replace chicken noodle soup as the most comforting soup in the world! The broth is full bodied, the ingredients simple and the process fast and easy! 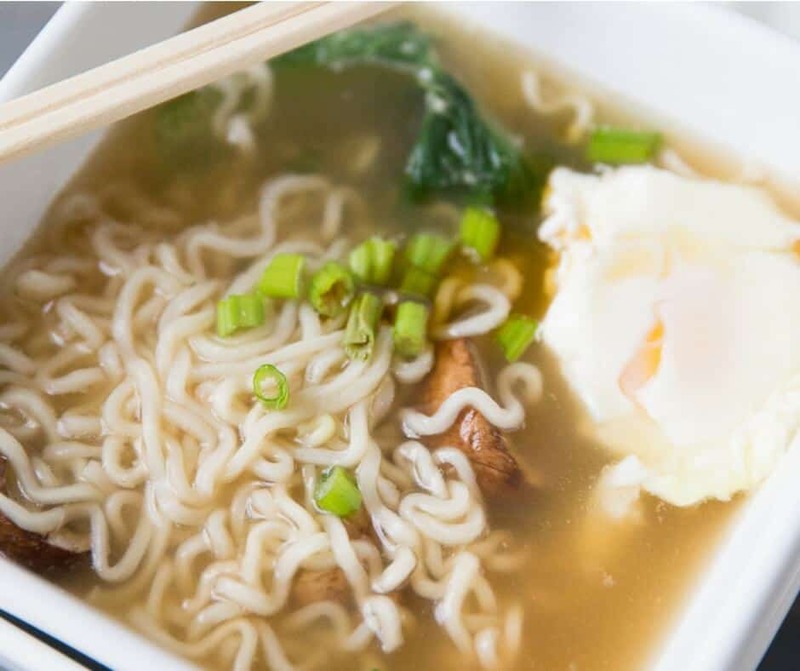 This Ramen Noodle Soup proves that ramen noodles are not just a dorm room staple. I did not eat very well when I was in college (who did, right?). I gained my freshman 15 by eating chocolate donuts from the dining hall for breakfast every single morning and by having beer and nachos every single night for dinner. Sure I walked and did aerobics, but the pizza I consumed afterward didn’t advance my fitness goals. When I moved out of the dorm, my diet did improve. I bought cookbooks and asked my mom for her recipes so that I could try to feed myself some decent meals. Buttered ramen noodles made frequent appearances on my dinner table. They were cheap and fast eats. Ramen noodles got me through four years of college. I still buy ramen noodles. My kids like to make them for quick lunches and they are fabulous in recipes like this Ramen Broccoli Kale Salad. Ramen noodles provide a fun crunch for those times when nuts will not do. They are excellent in Asian inspired dishes just like this soup! This soup was inspired by a recent dining experience. I had the loveliest ramen soup made with fresh vegetables, ramen noodles, pork belly and broth in a local Asian restaurant. I wanted to recreate it at home but I wanted to make my soup vegetarian. I think this soup was just perfect! 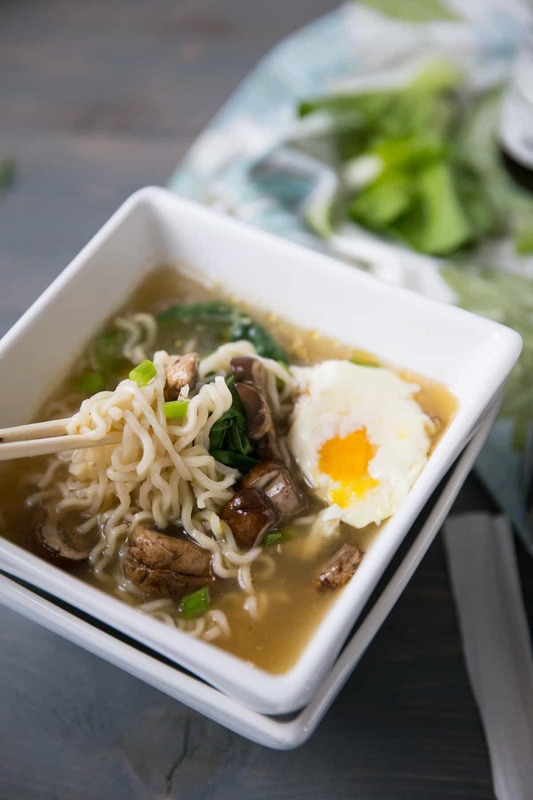 Noodles and mushrooms are simmered in a vegetable broth base that has both ginger and garlic for flavor. Bok choy adds a vibrant freshness to the soup while a poached egg adds protein. A drizzle of sesame oil finishes off each bowl just before serving! The egg is optional; shrimp, tofu, pork or even chicken can be added in its place. Serve this soup with Shrimp Lo Mein for a complete meal! 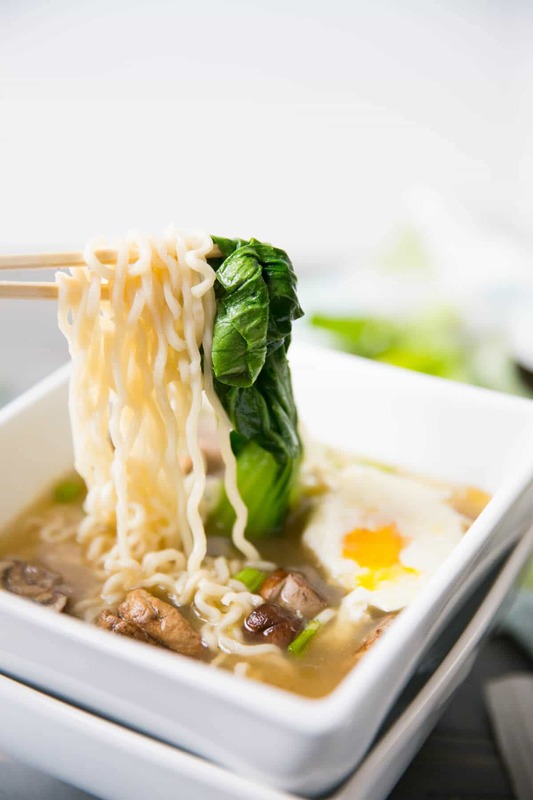 This soup is a good reminder to keep those ramen noodle packets handy! 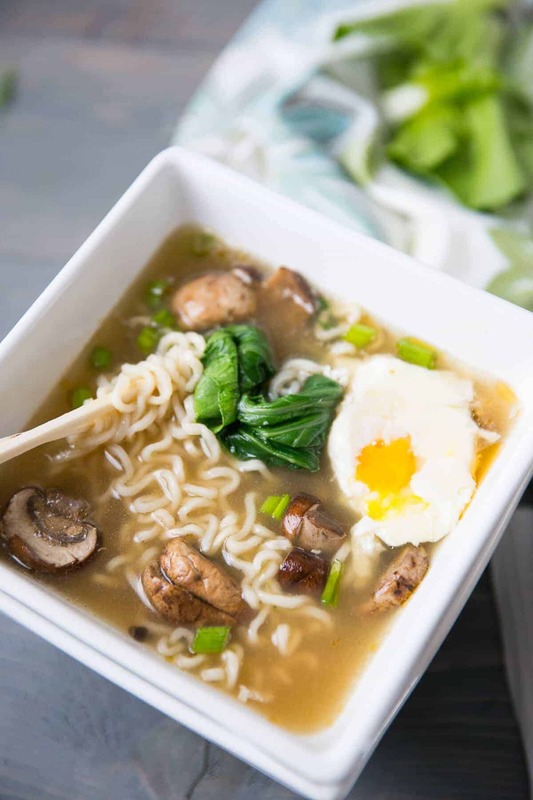 This Ramen Noodle Soup could replace chicken noodle soup as the most comforting soup in the world! The broth is full bodied, the ingredients simple and the process fast and easy! Place vegetable broth in a stock pot and bring to a boil. Add noodles and mushrooms to the broth along with the garlic and ginger; cook for 2 minutes. Add bok choy. Carefully crack eggs into the broth. Cook the eggs for 1-2 minute more, pouring broth over eggs until they are poached. Ladle the soup into serving bowls and drizzle with sesame oil just before serving.